FILE - Facebook ads linked to a Russian effort to disrupt the American political process are displayed as Google, Facebook and Twitter officials testify during a House Intelligence Committee hearing on Capitol Hill in Washington, Nov. 1, 2017. Now Britain is threatening Facebook and Twitter with consequences over Russia's use of the platforms in the run-up to last year's Brexit referendum. Social media giants Facebook and Twitter could face sanctions in Britain if they fail to be more forthcoming in providing details about Russian disinformation campaigns that used their platforms in the run-up to last year's Brexit referendum, the chairman of a British parliamentary inquiry committee warned. Damian Collins, chairman of the Department of Culture, Media and Sport committee in the British parliament, which is looking into Russian fake news' efforts, criticized both companies earlier this month, accusing them of stonewalling the parliamentary investigation. But he has now warned they risk being punished and he says his committee is exploring what sanctions could be imposed on Facebook and Twitter. "What there has to be then is some mechanism of saying: if you fail to do that, if you ignore requests to act, if you fail to police the site effectively and deal with highly problematic content, then there has to be some sort of sanction against you," he told Britain's Guardian newspaper. He dubbed the lack of cooperation by the social media firms as "extraordinary." "They don't believe that they have any obligation at all to initiate their own investigation into what may or may not have been happening, he said. "They've not done any of that work at all." 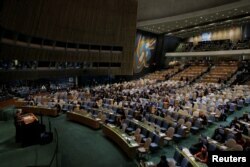 In September in New York at the annual general assembly meeting of the United Nations, British Prime Minister Theresa May expressed frustration with social media companies, saying they must go "further and faster" in removing extremist content and should aim to do so within two hours of it appearing on their sites. FILE - British Prime Minister Theresa May addresses the 72nd United Nations General Assembly at U.N. headquarters in New York, U.S., Sept. 20, 2017. "This is a major step in reclaiming the internet from those who would use it to do us harm," she said. The prime minister has repeatedly called for an end to "safe spaces" on social media for terrorists. And British ministers have called for limits to end-to-end encryption, which prevents messages from being read by third parties if they are intercepted. British lawmakers and ministers aren't the only ones considering ways to sanction social media firms that fail to police their sites to avoid them from being used to spread fake news or being exploited by militants. This month, Germany's competition authority accused Facebook of violating European data protection regulations by merging information collected through WhatsApp and Instagram with Facebook user accounts. Collins has written twice to the social media firms requesting information about suspected Russian fake news campaigns in the weeks and months before Britons voted in June 2016 on whether to retain membership in the European Union, Britain's largest trading partner. In a letter to Twitter, he wrote: "The information you have now shared with us is completely inadequate. … It seems odd that so far we have received more information about activities that have taken place on your platform from journalists and academics than from you." In response to parliamentary requests for information about Russian interference in the EU referendum, including details of accounts operated by Russian misinformation actors, the social media firms passed on copies of the details they provided to Britain's Electoral Commission, which is probing advertising originating from Russian actors during the lead up to the Brexit vote. In November, Prime Minister May accused Vladimir Putin's government of trying to "undermine free societies" and "planting fake stories" to "sow discord in the West. "Russia has denied the allegations. Russian Foreign Minister Sergey Lavrov (R) and British Foreign Secretary Boris Johnson enter a hall for their talks in Moscow, Russia, Dec. 22, 2017. 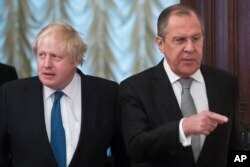 Three days before Christmas, Britain's foreign minister, Boris Johnson, sparred with his Russian counterpart, Sergei Lavrov, over the issue of alleged Russian meddling in the Brexit referendum. During his trip to Moscow, the first visit by a British foreign secretary to the Russian capital for five years, Lavrov denied at a joint press conference that the Kremlin had sought to meddle, saying Johnson himself had previously said there was "no evidence of Russian interference in the Brexit referendum." Johnson corrected Lavrov, saying: "Not successfully, is what I said." An investigation by the New York Times found that "Russian agents … disseminated inflammatory posts that reached 126 million users on Facebook, published more than 131,000 messages on Twitter and uploaded over 1,000 videos to Google's YouTube service" ahead of the U.S. presidential vote. In January 2017, the Office of the U.S. Director of National Intelligence concluded: "Russian President Vladimir Putin ordered an influence campaign in 2016 aimed at the U.S. presidential election." In October 2017, researchers at the City University of London found a "13,500-strong [Russian] Twitter bot army," was present on the social media site around the time of the referendum.